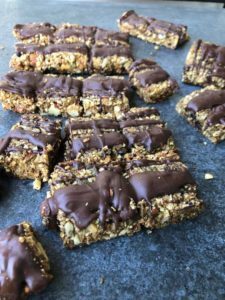 Whether you call them granola or muesli bars – these are vegan, free from refined sugar and grains. This makes them also a gluten free granola bar. In truth, it’s a nut bar. So delicious. 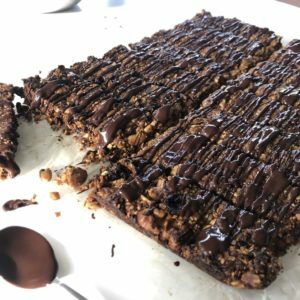 Paleo Granola Bar recipe below. The perfect pocket sized snack or lunch box treats. I’ve made these a number of times and I like them best when they are crunchy. So cook them low and slow. Additionally I like to cut them smaller as they are quite filling. Why bother with Paleo if you are vegan? Well, quite simply, it’s possible to be an unhealthy vegan if you fill your diet with wheat and flour based foods. Anytime you can swap the wheat out for something more nutritionally dense, you are doing yourself a favor. I don’t want to bang on about wheat flour here, (as so many experts have already written much about the topic), just make this and eat it because it’s delicious! You have the added benefit of knowing it is healthier than the regular shop bought muesli bars laden with sugar. These crunchy paleo granola bars have the addition of hemp powder. This gives them an extra protein boost. 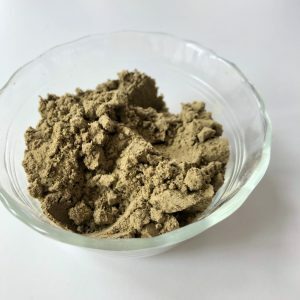 If you don’t have hemp powder you could swap for oats or leave it out completely. You could also leave out the tahini, but I include it because it is an excellent source of calcium. NOTE: What is just as important as putting nutritious food into your body? Having your body be able to extract and absorb the nutrients. For this reason I recommend soaking the nuts first and then drying them in a dehydrator. This will remove the inhibitor enzymes and make them easier to digest. Of course, like you, I sometimes can’t be bothered with all that and have still made this successfully without soaking the nuts first. Both work. But if you have the time, soak overnight then rinse and dry out in the dehydrator or oven on a low temp. Below 47 Degrees Celsius. 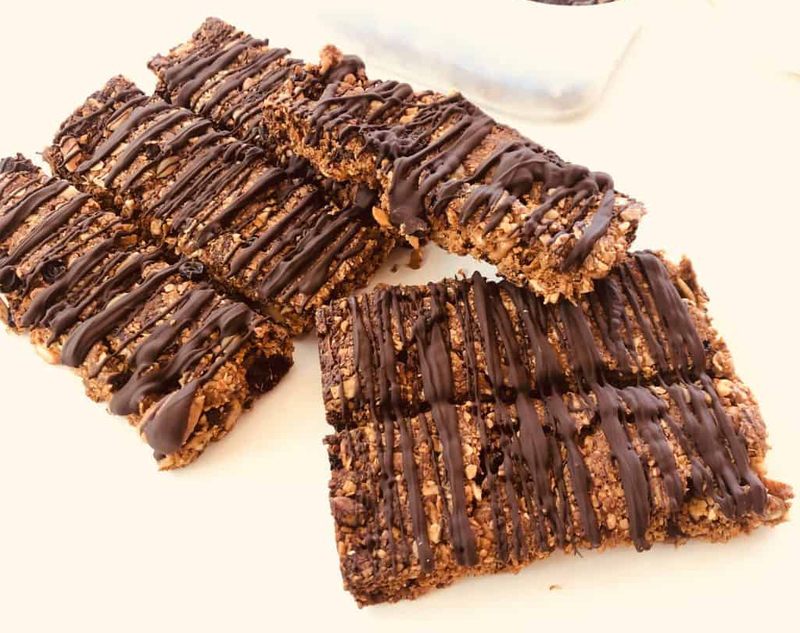 Drizzle granola bar with chocolate. Make your own or use shop bought vegan dark chocolate. On a low heat, melt the oil, tahini, nut butter, rice malt syrup, salt, and vanilla. Mix well in the saucepan until combined. Add in vanilla and cinnamon. In a food processor, blend half the nuts, all the hemp powder and all of the desiccated coconut until fine crumb. Roughly pulse in the remaining nuts and seeds so still chunky. Mix in fruit. Combine wet ingredients with dry. Mix well. Press into a lamination tray lined with baking paper. Bake in a low oven (160 degrees Celsius) for about 30 minutes. Be careful not to burn the nuts bars. When golden toasted, pull out bars and cut into slices while still warm. Allow to cool and top with melted dark chocolate. Store in fridge. Store in an airtight container. Natalie Prigoone is the author of ‘The Great Uncooking’ a raw food detox book and A Piece of Cake: Easy Raw Desserts. 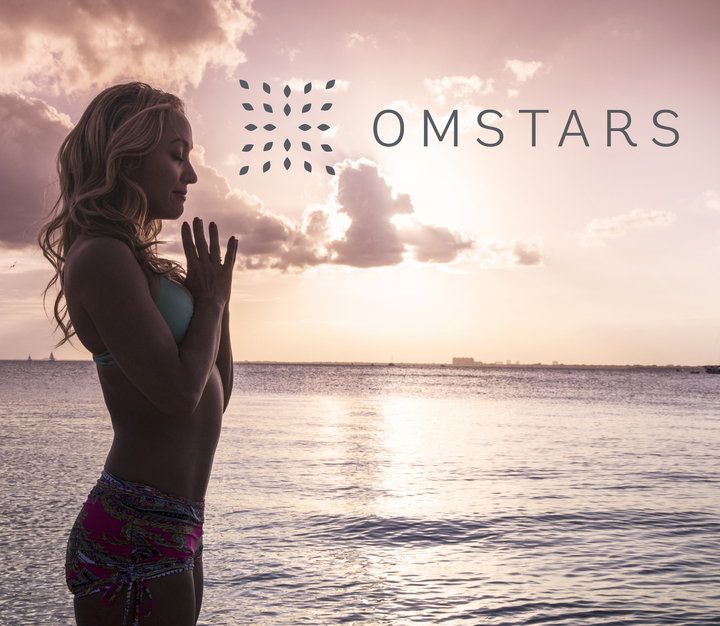 She is a yoga teacher, high school teacher and raw food chef. 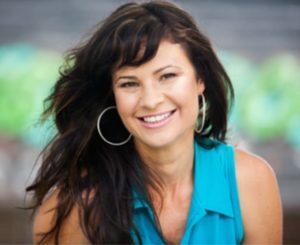 Natalie discovered raw foods and their healing magic in 2011. 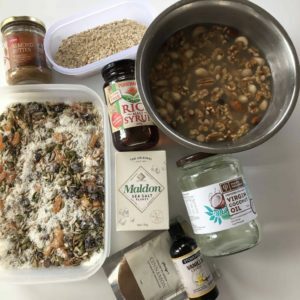 She is passionate about healthy life hacks, and creating recipes that lead to greater health and healing. Follow her on Instagram @thegreatuncooking or Facebook.